Balance & equilibriums; light & night. The equinox is a time of a transition. Come welcome the turn of the seasons (and the Easter Bank Holiday) with Eastern Margins and UNITI as we enter Spring with a trailblazing ensemble of East & South-East Asian audiovisual artists. 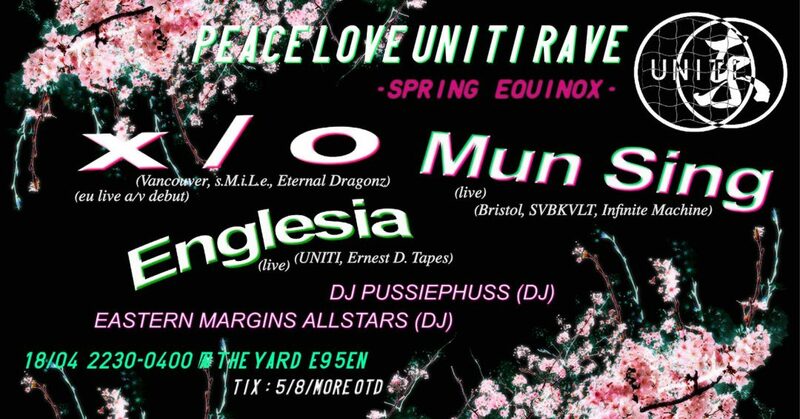 An instalment of PLUR (Peace Love UNITI Rave), a UNITI event series with themes of original rave culture prioritising womxn of and nonbinary & LGBTQ+ folks of colour, in collaboration with Eastern Margins a collective dedicated to creating space in London for East & South-East Asia(ns) music.